Italy is famous for many things, cars, fashion, soccer, pasta, pizza, coffee ..etc. Ice cream / gelato is definitely one of my favorites especially in summer time. 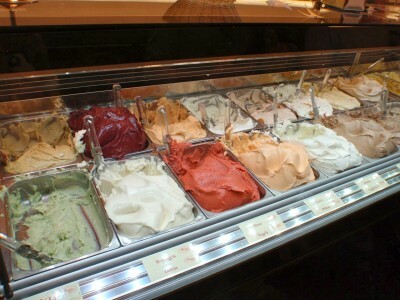 Although gelato is translated to ice cream but it is different from ice cream. First, it has a lower butterfat content. Typically its 4% to 8% compare to 18% to 26% (Haagen Dazs) in ice cream. Moreover, gelato’s fat content is due predominantly by the use of fresh milk cream, while fat found in ice cream is often originated by the use of industrial butter so it is surely healthier. But less fat does not mean less taste. As gelato is less frozen than ice cream, and melts in the mouth faster, one can taste the flavor immediately. Second, gelato has a higher density (much lower air content) than ice cream due to the difference in making process which result in richer, creamier taste. Third, gelato is served at a ‘warmer’ temperature than ice cream which means the taste is more enhanced once it enters the mouth. There are thousands of gelateria in Milan, big ones, small ones but there is one particularly stands out from the rest, a small gelateria named “Il Massimo del gelato”. It is tugged in a small street in Via Lodovico Castelvetro, 18 (zona Sempione), half way down Corso Sempione (near ‘Ospedale Buzzi’) . Usually there is a long queue right outside the gelateria. You need to queue up to buy the ticket from the cashier. Then you will be given a receipt (scontrino) and a number ticket which you will have to keep. 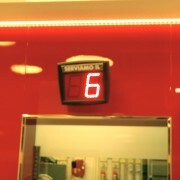 At the back of the gelato counter, you will find a red number displayer on the wall. You have to wait till your number is displayed and called. Giving the receipt and the number ticket to the girls behind the counter and they will then hand you the gelato. It is the same price for cup (coppetta) and cone (cono). For 2 types of gelato/ 2 scoops (2 gusti) cost 2.50 euro and 3 types of gelato/ 3 scoops (3 gusti) cost 2.90 euro for 145gm and 3.60 euro for 180gm. I think the price is quite reasonable. They have 9 different types of chocolates : chocolate w/ rum (Jamaica), dark chocolate w/ gold (Vero Oro), chocolate w/ cinnamon and chili pepper (Cioccolato all’Azteca), milk chocolate w/ nuts (Wiener Küsschen), classic chocolate ( Esmeralda), chocolate w/ gran marnier, orange and fruit candied peels (Fiji), chocolate w/coffee, sour cherries and liqueur (Cavour), chocolate w/ hazelnut (Gianduia)…etc plus other flavors like pistachio (Pistacchio), almond (Mandola), walnut (Noci), coconut (Coco), mango, pear (Pere), strawberry (Fragole), raspberry (Lampone), lemon (Limone), ginger (Zenzero), coffee (Caffe) and a few others. Personally I like Gianduia, Mango, Coco and Pistacchio. 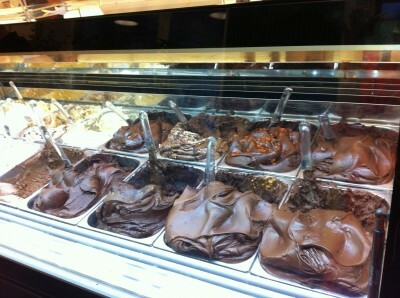 Words are hard to explain the creaminess and the intense favor when the gelato melts in your mouth! Just by writing and looking at the photos make my mouth waters! 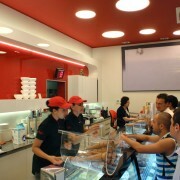 This entry was posted in Restaurants and tagged gelateria, gelato, Il Massimo del gelato. Bookmark the permalink. It is great post ! I simply love’d this ! certainly like your website however you have to check the spelling on quite a few of your posts. A number of them are rife with spelling issues and I to find it very bothersome to tell the truth nevertheless I will definitely come back again. Thank you for your comments. I did spell check everything that I wrote but there are obvious difference in spelling between American and English spell check eg. specialise and specialize. However, I do appreciate your feedback. Im impressed, I have to say. Very rarely do I come across a weblog thats both informative and entertaining, and let me tell you, youve hit the nail on the head. Your blog is vital; the problem is something that not enough folks are talking intelligently about. Im genuinely happy that I stumbled across this in my search for some thing relating to this concern. After study a few of the blog posts on your web site now, and I really like your means of blogging. I bookmarked it to my bookmark web site record and can be checking back soon. Pls try my site as effectively and let me know what you think. Thank you. I have tried your site but I do not know exactly how it works but it sure looks great ! I’m not sure exactly where you are receiving your info, but good subject. I desires to invest some time learning much more or understanding additional. Thanks for wonderful info I was looking for this information for my mission. Than you very much for your compliments. All the restaurants and places that I talked about in my website were my own personal experience and I am so glad that you like it.